Moments after Prime Minister Narendra Modi completed his speech at a rally on Sunday in Guntur, Andhra Pradesh, chief minister Chandrababu Naidu went on an offensive to counter Modi’s scathing charges. Responding to Modi’s claim that Naidu was only interested in his son Lokesh’s rise and not the state’s development, the Telegu Desam Party (TDP) chief said the Prime Minister wouldn’t understand much as he didn’t even give due respect to his wife. Claiming that Naidu was always keen to portray his seniority, Modi said the former was his senior in defections, back-stabbing and opportunist politicking. Rejecting the backstabbing jibe, Naidu said he need not learn morality from someone who has not shown any respect to his political guru, LK Advani, adding his entire family was together in the fight for democracy. Claiming that Modi seemed to have come to Guntur on a special flight to humiliate him, Naidu said the former was only seeking revenge. The Andhra CM said Modi was on an attacking mode because the former had sought his resignation as Gujarat chief minister after the Godhra carnage. This was Modi’s first visit to the state after TDP snapped ties with the BJP at the Centre in protest against the Centre’s step-motherly treatment towards Andhra Pradesh after the bifurcation. Naidu, who has been wearing black as a symbol of the protest, said despite his several visits to Delhi seeking funds for the state, there was no response. 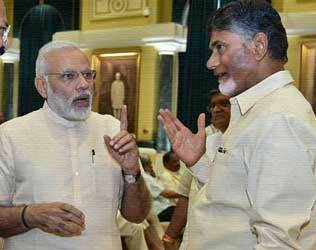 Responding to Modi’s claims that Naidu was more interested in Modi-bashing than developing the state as the chowkidar (watchman), as the PM had disturbed his sleep and sought details of all the funds given to Andhra, the chief minister said it was the job of the Comptroller and Auditor General to look into the accounts and not the government. The Union government was misusing institutions like the income tax department and Enforcement Directorate. He said every party was in support of developing the state and was backing his ‘deeksha’ in Delhi on Monday seeking special status for Andhra, except YSRCP chief Jagan Mohan Reddy, because he was hand in glove with the BJP. Naidu said Jagan had made arrangements for the BJP gathering in Guntur because he feared his cases would otherwise be reopened by the CBI and ED. He also slammed Telangana Rashtra Samithi chief K Chandrashekar Rao and called him Modi’s slave as that helped him secure more funds for Telangana. Naidu said Modi had promised to help build the new Andhra capital Amravati that would be even better than the national capital. “How do we build such a capital without money?” asked Naidu, adding the Prime Minister was only making false statements and in fact, the Centre was busy robbing the resources of the state.